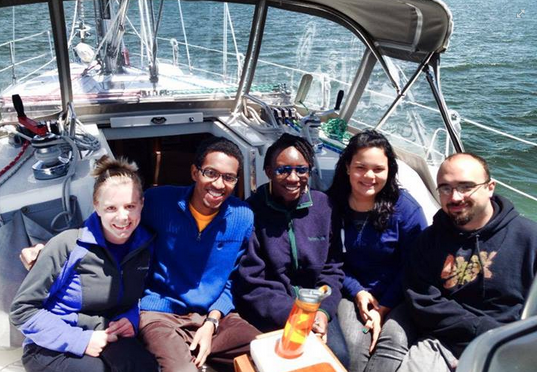 Here is a picture of the REU (Research Experiences for Undergraduate) students and I sailing in Lake Michigan earlier this summer. It was slightly cold that day at 59℉ with 15 mph winds but also surprisingly sunny, which meant we needed to whip out the sunscreen. Fun in the sun in between talking science! Nanoparticles are found in abundance in cosmetics. They were one of the earliest lines of consumer products to use nanoparticles. There are many properties of nanoparticles that make them attractive for use in cosmetics. Some of them are antibacterial, so they can be used to preserve the shelf life of products. They can also be used as carriers for scents, vitamins and minerals, and have other favorable skin-care properties such as hydration. Nanoparticle size and shape can also be changed to enhance or make more natural colors. Scientists have also found that gold nanoparticles can be nearly any color of the rainbow, depending on their size/shape combination. Imagine the face paint possibilities! 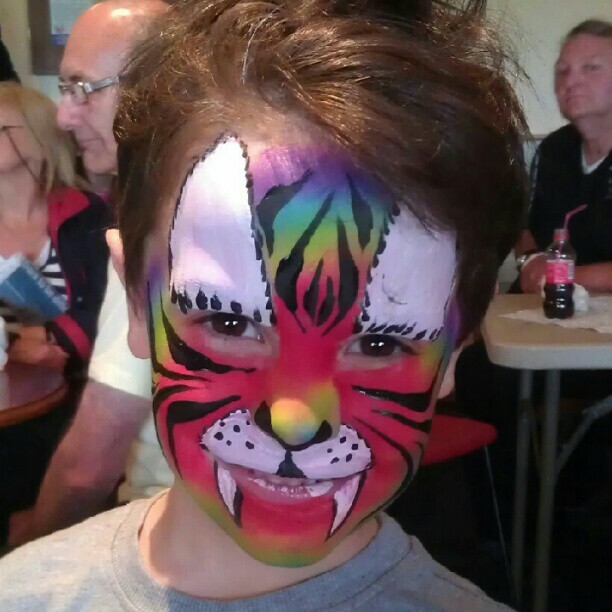 Awesome rainbow tiger facepaint: recommended. Using gold nanoparticles to do it: not recommended. Image source. Pop Quiz! 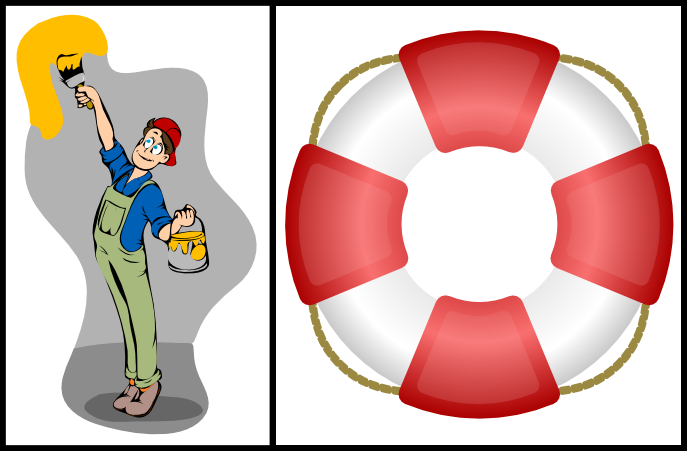 What do artists and lifeguards have in common? Answer: Titanium dioxide and zinc oxide. Almost all white paints and most sunscreens contain either titanium dioxide or zinc oxide. Those two compounds contribute to the white color we see. Titanium dioxide and zinc oxide are used in sunscreens because they can absorb, scatter and reflect ultraviolet radiation. Ultraviolet radiation is invisible to the human eye and is known to age cells as well as damage their DNA. 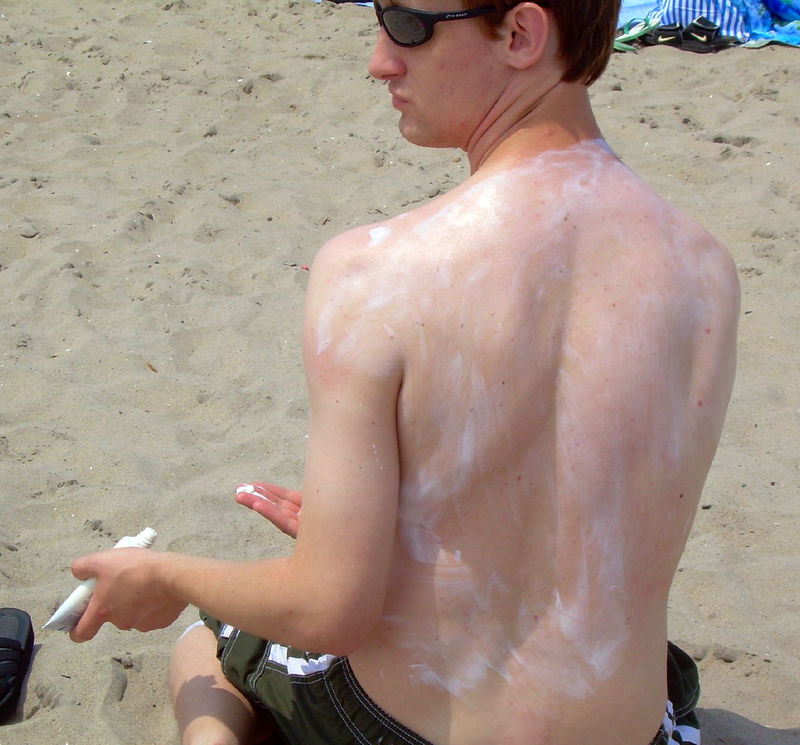 Sunscreens must contain agents that can combat all types of ultraviolet radiation that reach the earth’s surface. In the pre-nanoparticle days, titanium dioxide and zinc oxide sunscreens were thick and left a white residue, which made their application unappealing and ruined pictures. Manufacturers responded to this by inventing a new type of sunscreen that left you instead with a comfortable, summer glow. They realized that by using nano-sized clusters of titanium dioxide and zinc oxide, they could produce sunscreens that were nearly transparent. However, when making something nano-sized you can change its properties dramatically compared to its larger counterparts, and these changes can be difficult to predict. This uncertainty makes some people wary of using products that contain titanium dioxide and zinc oxide nanoparticles. Some of these concerns have been addressed, while others are still being researched. One characteristic of nanoparticles is that their small size and large surface area allow them to be in close contact with other surfaces, like skin. Titanium dioxide and zinc oxide are also known to produce reactive oxygen species (ROS), which can harm DNA, RNA and proteins, the building blocks of our existence. For these reasons, manufacturers have researched ways to eliminate the direct interactions between these sunscreen nanoparticles and skin. To do this, they coat the nanoparticles with chemicals like aluminum hydroxide and silicon dioxide, which decreases the nanoparticles’ ability to make harmful ROS. Based on the plethora of questions on blogs and websites about nanoparticles in consumer products, it seems like people have taken this quote to heart. For example, what happens when people with sunburns, open wounds and skin conditions like eczema apply sunscreen that contains nanoparticles? Will the nanoparticles be absorbed into tissue or blood? How will they interact with cells? Will their coatings still be active or will ROS be created? Or what happens to the sunscreen in combination with other chemicals such as other cosmetics or chlorine in pool water? Scientists have recently discovered that chlorine acts like a chemical peel; it strips away the protective aluminum hydroxide coating on titanium dioxide nanoparticles, exposing the bare titanium dioxide and unleashing their ability to make ROS. Perhaps one of the frontline questions is whether titanium dioxide and zinc oxide nanoparticles will tamper with ecosystems. For example, how will other animals and plants on which we humans depend be affected by the remnants of sunscreen that end up in water? Finding answers to these pressing (and interesting) questions drives scientists, like the ones in this research center, daily. Hop on our scientific sailboat (the blog) and join us as we explore this sea of questions. Do not forget the sunscreen!